I've been putting off writing Karsten's birth story, or even thinking it over and retelling it to myself. I can't say why. Maybe it's that it's my third birth. Maybe it's that I've been able to keep it more special and private if it's not recited or shared. Maybe I'm just not sure what to make of it. Maybe a little of all of those. Labor lasted a long time. What does "long" mean? Weeks, folks. It lasted freaking weeks. All right, technically that's called "prodromal labor," or "practice labor." Or "stalled labor" or "false labor" (grr … my uterus didn't think so). At any rate, that went for a good long while. I thought Karsten was going to be born around 38 weeks, but he hung in there till nearly 41. So, every day, I had contractions, many times at regular intervals, and lasting for several hours at a time. And then they'd peter out, and I'd scratch my head and go "huh." 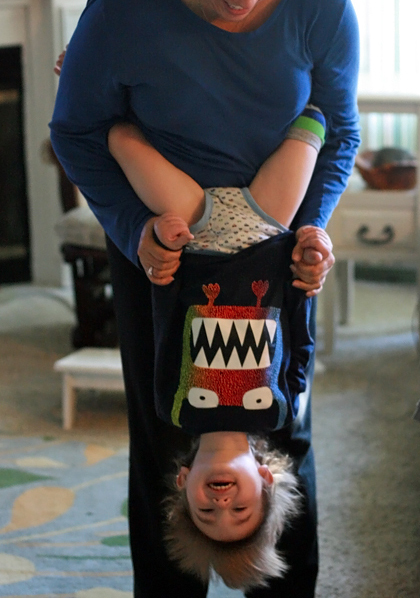 Karsten kept bobbing up and down in my belly, at one moment so low I could barely waddle, making me sure he'd just, plop, fall out onto the floor, and then the next bouncing back discouragingly high up. I walked miles each day. I lunged and climbed stairs like a crab and did pelvic tilts and slept in the Sims' position, all to open my pelvis and engage that stubborn baby. I drank red raspberry leaf and nettle tea to tone the uterus and ate dates to soften the cervix. I always tried to get plenty of rest in case this was "the day." I kept myself well fed in case I needed the energy for birthing. 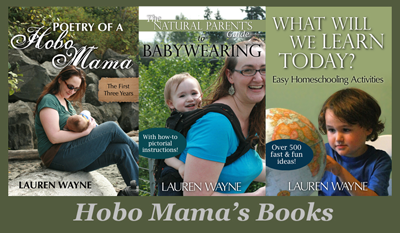 I did all the techniques I could Google about how to kickstart a labor, turn a baby into optimal position, free my mind and spirit for birth, etc., etc. I tempted fate frequently: traveling far from home, doing activities that were interrupted when previous children were born, making firm plans in expectation of having them broken. Karsten could not be moved. He was taking his sweet, sweet time, and there was nothing I could do about it. I'd been hoping this labor would be more like Alrik's than like Mikko's. To recap, with Mikko I had 42 intense hours of back labor, culminating in a transfer to the hospital and finally a no-meds vaginal delivery. It was empowering that he came out through my strength alone — all 11 pounds, 13 ounces of him — but after the fact, we could guess that he had been posterior, we could see that he came out with an arm wrapped around his head (aka nuchal arm leading to an asynclitic head positioning, both of which are suboptimal), and, well, he was obviously huge. Alrik, on the other hand, was my wonder birth. The one that redeemed the disappointment of failing to homebirth the first time around. Alrik's birth was just long enough to be real, but short enough that I could make it through without much worry or discouragement. I was practically giddy throughout until the final few hours of concentration. It was much more textbook in that the pains where were they should be — in my abdomen — and honestly, I wasn't even sure which kind I preferred, but it did at least feel like everything was working "right." Having been trigger happy about calling the midwives early with Mikko, we held off with Alrik … until it was too late. Splash! Out he came into the birth pool and his father's waiting arms, and the midwives arrived minutes later to hear the joyful sounds of a mewling newborn and happy parents upstairs. That was how birth should be. That was part of what convinced us we should do this thing again and have a third. So, now, what was this stupid prodromal nonsense? Why was my body contracting and contracting and contracting but nothing coming out? I kept checking for signs. Was there more mucus when I wiped? Could I feel my cervix opening? (Hint: I had no idea what I was feeling.) I even let my midwife check at my final midwife exam (not knowing it would be the final, of course). I told her not to tell me numbers, that I didn't want to be discouraged. She obliged cheerfully and told me she could tell things were on their way, but there was no telling when everything would finally just finish. (Story of my late-third-trimester life.) She told me to stay in touch and let her know of any changes, even if they seemed insignificant. She surmised that, with all these warmups, and the fact it was my third baby, once real, live, active labor started, the baby would whoosh out. She wasn't kidding. But that's getting ahead in the story. On October 19, a Sunday, I woke up at 6 a.m. with regular contractions. "This is it!" my optimistic heart cried. My logical mind sneered a retort: "Says the pregnant lady who loves to cry wolf." I'd been getting everyone's hopes up for weeks. I wasn't even sure I should say something this time. But I did, finally. Seven-year-old Mikko didn't buy it. Sam debated when to call the midwife. I said to let her sleep and call at a reasonable time, especially since this was the weekend. Relieving all my fears, H was not in fact annoyed with me for calling and was excited along with me that this could be the day. The real day. For realsies this time. Sam started filling the birth tub so I could relax through my paranoia that there otherwise wouldn't be enough time. (It takes three water heaters' worth of refills.) We gathered supplies and made the bed appropriately with the plastic sheeting. I bounced on my birth ball while Sam efficiently scurried through the preparations. Even if this was all premature (and I was sure hoping it wasn't), it felt better not to worry that it wouldn't get done. H came over in the late morning with an assistant and checked out how things were going. I had the same reaction as usual, feeling like these midwives were way too casual and leisurely since clearly I was having this baby NOW, and simultaneously feeling embarrassed I'd bothered to call them out since clearly the baby was coming NEVER. Labor doesn't play well with logic, and I'm awkward with social situations under the best of circumstances. But, anyway, good news! She felt around, and the baby's head was definitely down and engaged. She asked if she could do a cervical check again. I'd had plans to refuse but honestly didn't mind as long as she once again didn't tell me any numbers. She again pleasantly agreed and was very encouraging when she announced that things were much further along than when she'd last checked me in her office. Since I have no numbers, I couldn't tell you if that was a 5 or what, but clearly it wasn't a 10. I'm guessing 5. All I can say is that not knowing the number was a really, really good thing. Even if she'd delivered the same message of encouragement but with the number, all I'd have been able to focus on would be how much farther I had to go. Without the number, it was all about how far I'd already come. We'd called Natalie, Sam's sister, and now she was over to hang out with the big boys. So Sam and I headed outside on what I'm sure for others was a beautiful, unseasonably warm fall day. All I felt at 40+ weeks pregnant was the unseasonably warm part. I struggled up the huge, long hill just past our street, leaning on Sam's arm and hoping against hope my beleaguered pelvis didn't shatter. I tried to walk through some contractions, the better to open my stubborn birth canal (I guess? ), and swayed with Sam through others. At some point I cried uncle. Going uphill was too hard on my sad pregnant hips. We turned and walked back down, but I powered through with a walk on level ground by the beach. Once more, as with Alrik, so many people were out enjoying the sun and the water, and I could think about how surreal it was that I was in labor amidst their blithe merriment. To head off any intrusiveness, I emailed everyone in our family to let them know I seemed to be in labor and that we'd check in with any news, and that hopefully the news would be that a baby had arrived. Our parents were happy to hear from us, and they mercifully didn't pester us then for updates the rest of the day. Because what would I update? Nothing's happening. H sent her assistant home and went home herself for awhile. As with Mikko's long labor, I kept fearing I was underperforming for the midwives by not being an avid enough hill climber, stair lunger, etc. Mostly I just wanted to sit down — or lie down — or, best yet, get in that blessed warm tub — and rest. Anytime H wasn't around, I did just that. The water felt wondrous, and I could just hang out on my knees with my cheek resting against the inflated side and relax. Since I wasn't supposed to stay in too long, I'd alternate with showers. I loved the water, craved it. In the room, I kept my Hypnobabies Birthday Day playlist on repeat. In my mind, I continued the mantra I'd crafted for myself on one of my long late-pregnancy walks along the beach. I knew I wanted to flow with the waves, ride instead of fight them. I'd looked out over the surging waters for my inspiration. Was I a rock, solid and steady? No, the waves would crash against me. Was I a seagull mama, riding along the crests? No, but I enjoyed seeing them fly off, one with me in spirit. Was I a stick of driftwood, bobbing along? No, too stiff. I saw it: I was seaweed. Limp, verdant seaweed. I know, not too flattering a comparison, but it was the perfect visualization for me during the long, hard contractions: I am seaweed. I go loose, and limp, and ride the waves into shore. I'd noticed the similarities to Mikko's labor already, of course. The length. The midwives' boredom. (Not their fault, and they didn't blame me, just … you know … hours spent waiting.) The building of pressure in my back. I wondered, and worried, was this another posterior, huge baby? No way out but through now. I just hoped I could hold it together for a homebirth this time. In the evening, we all went out for dinner on the beach: Sam, Natalie, the boys, and me. I chose a burger and sweet potato fries so I'd have plenty of protein and carbs for energy. We were all in a state of excitement during the dinner, waiting, waiting. I had to chew between contractions. H checked in with me again. She had to gather back up her equipment to take home in case she needed it for someone who was actually giving birth. I felt bad that she had to carry it all back and forth from wherever she'd parked, multiple times. I sent Sam to help her. I'm sure I apologized for wasting her time, and I'm sure she told me not to be silly, that this was her job, and I know she meant it sincerely, and I know that I still felt like a doofus. She told me to take a warm bath (sure thing!) and some Benadryl (she told me the dose, which was higher than for allergies) to make me sleepy so I could try to rest through the contractions overnight. Natalie fortuitously had some Benadryl with her to ward off her reactions to our cats, so Sam brought the packet upstairs, and I debated when to take it. I was hesitant. I kept thinking, Any moment now, this baby is going to break loose, and I don't want to be all groggy and drugged. I sort of had been thinking, If only H weren't waiting on me, then I know the baby would come. And: Once it's night, and I'm alone and still, surely then the baby will come. But now it was late, Sam got Alrik to sleep in his room, Mikko was bedding down with Natalie on the sofa bed downstairs, and Sam needed some sleep himself. I wrote our families to let them know there was no news but that everything was all right, and that we were going to try to get some rest. I gathered my courage and took the Benadryl and tried to lie down for a decent night's sleep through the contractions. I'd never had my water break like in a movie before. That was kind of cool, I have to admit. Surprising, though! Like being slimed on Nickelodeon. "Sam! Sam!" I prodded him in my urgent whispering. "My water just broke! I'm soaked!" Good thing we plasticked the bed and I was sleeping on towels and piddle pads! He woke up groggily. I felt out of it, too, on the Benadryl that I was, as predicted, regretting. No worries, though, because two things happened in quick succession: I stumbled into the tub, and then I threw up. Sam fortunately got the bowl to me in time. That took care of some of the Benadryl, and all of the hamburger. It would be awhile before I wanted to eat at that burger place again. One of us had the sense to call the midwife. There was no time to wait, though. This was it. If this hadn't been my last baby, this labor would have made it my last baby. I couldn't believe how intense pushing out Karsten was. He felt like he was ripping my body in two. Sam got the video camera running, set up beforehand on the tripod, and I realized through my haze of Benadryl and labor pangs that I really should stop dropping the f-bomb on film. I didn't give in to the pain or panic, though. I didn't have time to put on my Hypnobabies pushing track, but my mind knew to concentrate and stay calm. This baby was coming OUT. This was go time. I pushed. Oh, heck yeah, I pushed. During contractions, between contractions. I was not stopping until this horrible, horrible feeling stopped, and I knew the only way to make that happen was to get this baby OUT OF ME. In between contractions (holy mother, those contractions! ), I asked Sam what he could see. There's a baby coming out! he confirmed. Of course there is! I pushed some more. Sam was ready for it this time. He stripped off his shirt and knelt in position on the side of the tub, reaching down his arms. Karsten's head popped free of the aptly named ring of fire. "Keep pushing!" Sam said. No, no, I calmed him, it's fine. Just wait. I'd pushed Alrik a little too fast, I'd thought, spurred on by adrenaline and coaching. I was going to let Karsten come out as he needed to, and perhaps spare myself some tearing. I pushed again, and the shoulders emerged. That slippery, full, slimy feeling, it's like no other. I'm so pleased to have felt it three times. Karsten was born. Sam caught him fully, like a boss. Up onto my chest he scooped him, and we both checked out our precious new bundle. We were laughing and oohing and chattering to our sweet new baby. I rubbed his body and talked with him and kept him cradled in the warm water and against my skin and was relieved he pinked up right away. Where was the midwife anyway? The water was a freaking mess, unlike with Alrik. I won't describe it, but suffice it to say, it was soon time to emerge from this CSI-level tank and wrap up in some clean towels on the bed. That was how Natalie found us several minutes later — she had woken to my grunting and swearing above and waited fifteen minutes, timed, to intrude. She then went back down to let in H, who arrived a few minutes after that, and just in time to help me deliver the afterbirth. I was glad H was there, because I was bleeding quite a lot after that, again, just as with Mikko. This was another big baby and another big placenta. When I had it encapsulated the next day, the cheerful woman who did the procedure came back with two full bottles, exclaiming that she usually got only one out of a placenta. 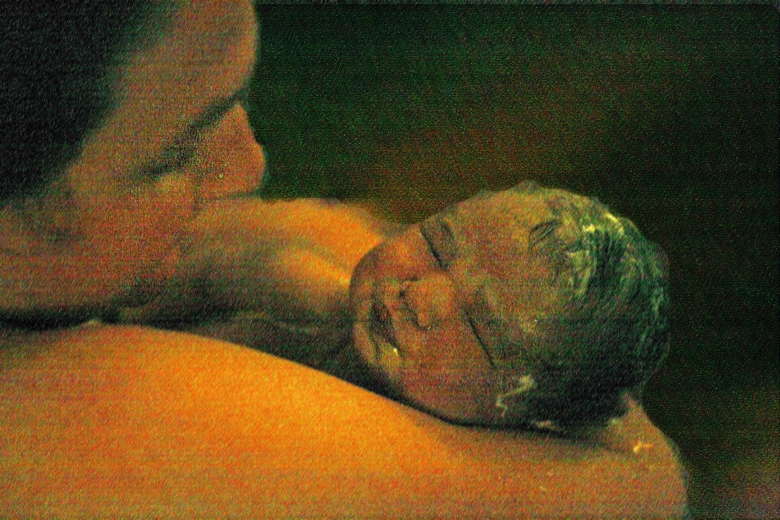 H worked her midwife magic and got the bleeding stopped, but we noticed by this time I was shivering violently. When she took my temperature, it was highly feverish. To cut short any suspense here, it turned out to be just my body's stress reaction to labor and went away on its own within the next several hours, but it was nice to have a professional there to monitor the baby and me and make sure everything was all right. 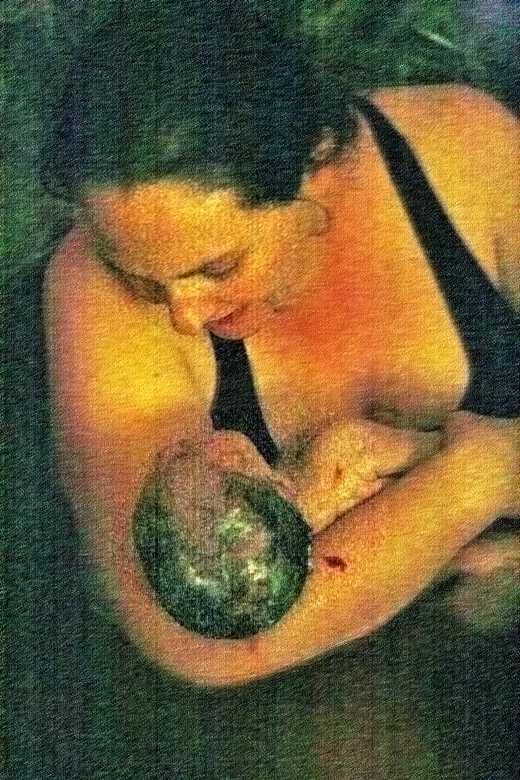 I swear we did not mean to repeat our surprise unassisted home water birth. Even though it went really well with Alrik! But I did have this inkling that that was the way I was meant to birth. I'm just that kind of person, or that kind of mammal in general. I like to go into my hidey-hole and be in the quiet, with just one helper I trust (Sam) who won't bother me, and work on the labor all by myself, intuitively. I've consistently given birth in the wee hours of the morning, which is the perfect time to be alone. I've read too many grim statistics about birth outcomes to feel logically comfortable choosing unassisted birth for myself from the get-go, but clearly my body chooses it for me. I kind of wish it were a valid option in my state to hire a midwife just for the aftermath, as happened anyway. At any rate, I lay in bed and was fussed over, stitched up (just a few stitches), uterine-massaged (aka punches in the gut on the sorest muscle you have), and photographed with my sweet, sweet baby. Karsten, meanwhile, nursed on and off like a champ and had his vitals taken. He was a very healthy baby at a very healthy size: 10 pounds, 6 ounces, and 22.25 inches long. He beat Mikko for length at least! We couldn't believe how much he looked like Mikko, just a wee bit smaller. And I was so, so, perhaps traitorously happy that this birth was over, and that I was never going to go through that again. It ended up being about 2 weeks of pre-labor and 21 hours of active, with about half an hour of pushing once my water broke. It wasn't even long enough for the midwife to arrive, clearly! This was a hard labor, and I was proud of myself for getting through it so admirably, but also really relieved to be done. Especially because, unlike with my first labor and still somewhat unlike my second, I had known what was on the other end: Karsten. With Mikko, the fact that a baby was coming out was surreal. I couldn't picture what he would look like, and I recall being surprised when I saw his face for the first time. With both Mikko and Alrik, we didn't know whether it was a boy or girl and therefore what their names would be. But with Karsten, we started calling him by name halfway through, when we had a blood test that confirmed Y chromosomes, and I felt more prepared for him than either of the others — I had more familiarity with the fleeting, slogging-yet-heady days of newbornhood, and I was totally ready and excited to meet him. And I knew that birth was the way it would happen, which made it all worth it. So, there it is. My last birth, my last birth story, two-plus years in the telling. Stay tuned for the birth video, also cobbled together over many months. I am proud and awed and ecstatic to have been given the privilege of birthing my three sons. Karsten's story was one of starts and stops and then sprints, and plenty of quiet drama along the way, but it was beautiful and precious and our own. Our bodies are amazing, and birth is beautiful. I'm so glad to have carried you, Karsten. I'm so happy to have birthed you from my body. I'm grateful you were able to come into this world in the peace of warm water, muffled curses from your mother's familiar voice, and then excited squeals and a long, quiet time of nursing and snuggling. We're so glad you're with us, and we're honored to have you as part of our family.